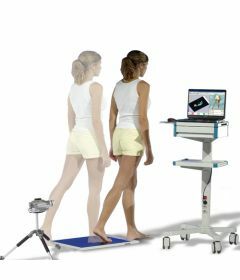 The zebris multifunction, force-measuring plate comprises a number of calibrated, capacitive forcesensors and enables the force distribution of static and dynamic forces under the feet to be analyzed when standing and walking. In this way foot deformities, foot function and posture can be analyzed. Any number of stance testsand roll-off patterns can be carried out directly one after the other. Using additional measuring modules, a balance analysis and a load-sequence feedback are possible. The results will be available immediately after the measurement as an evaluation report. The measuring plates have a video synchronization output as standard and are therefore already designed for connecting the video module that is optionally available. An infrared transmission module is available for synchronizing the EMG measuring system.